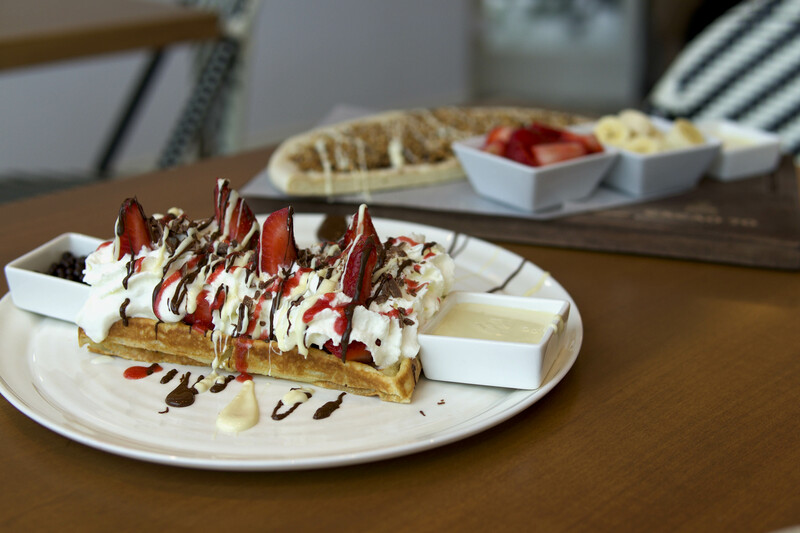 The business has three sections: the Sweet House, which is Cacao’s retail store for chocolate bars and other sweets; the Eatery, for their brunches, lunches and chocolate dishes; and the Dippery, a fresh concept where ice cream cones are dunked in gourmet chocolate dips. My first impression of Cacao 70 was elegance. The beautifully tiled floors, the patterned chairs, and a variety of floral designs on each wall add modernity to what feels like a classic, British tea house. While elegant, the spot is fairly casual. 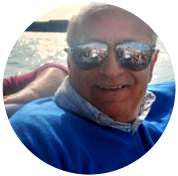 Staff were dressed in apron-baseball cap uniforms, similar to what you would see at many fast food establishments, and guests wore jeans and sweatpants. The weather on the day that I went was quite bad, so a limited number of people filled the restaurant. I luckily had my choice of seats and opted to sit close to one of the massive windows with "State of Chocolate" decals all over it. Overall, the atmosphere and decor were quite nice and beautiful. 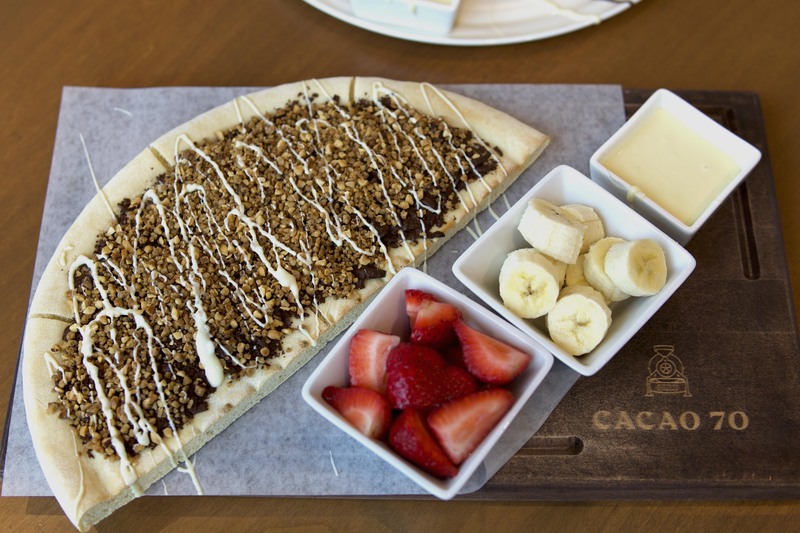 Cacao 70 is a dessert place first and foremost. The menu was lined with sweet crepes, waffles, chocolate fondues, ice cream sundaes, and their famous chocolate pizzas. 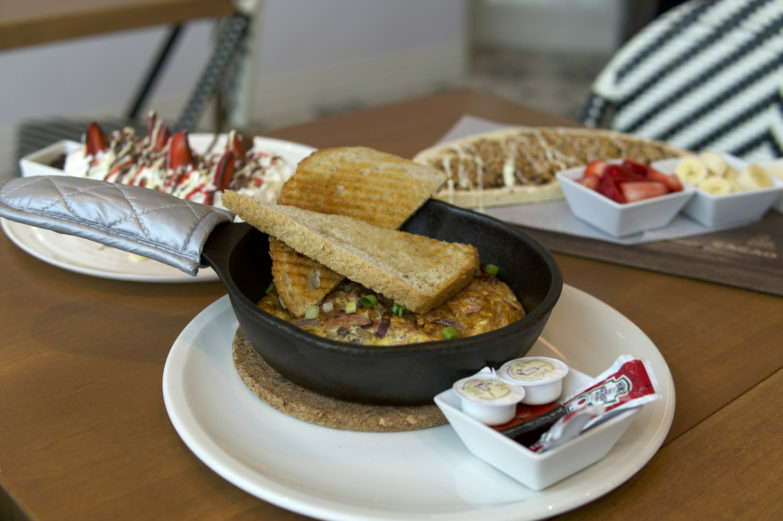 The menu does, however, also provide options for lunch and brunch as well as a drinks menu filled with café classics and signature hot chocolates that come in milk, white or dark chocolate. Cacao isn’t expensive but isn’t cheap either. Half a chocolate pizza costs $21.75 while a full one costs $30.75. Other desserts, such as the waffles, crepes, and ice cream sundaes, range between $10-$20. 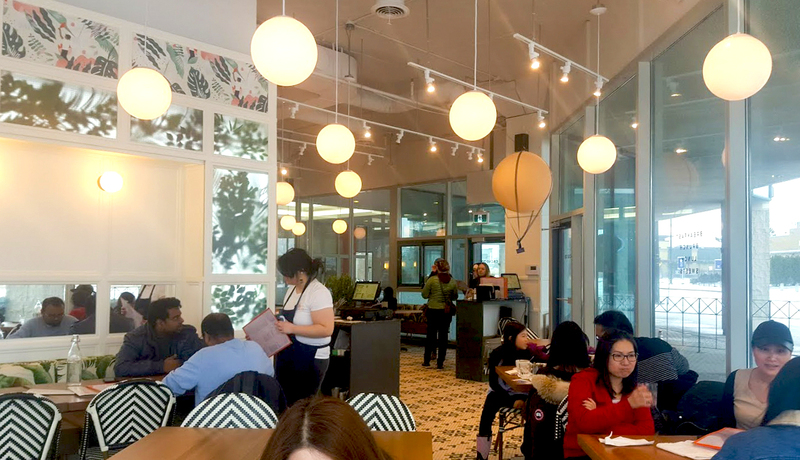 Brunch items, which include a range of omelettes and frittatas, all ballpark at around $15 and the sandwiches and wraps on the lunch menu were slightly lower, at approximately $10. 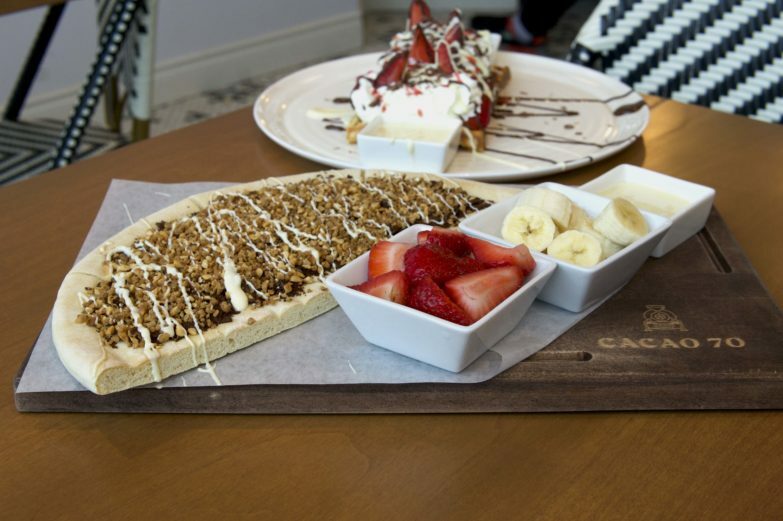 Again, Cacao70 is first and foremost a dessert restaurant, so the savoury menu was limited. There weren’t many appetizer options, so I opted to go straight to the main course and indulge in double the desserts later on. By the time I began ordering, it was around 12:00 PM. I really wanted to try the brunch menu and luckily it goes until 4:00 PM. The American Frittatas looked delicious from its menu description: "An American-style Frittata with bacon, smoked ham, roasted red onions, green onions and maple syrup". It had me at bacon and maple syrup. It wasn’t an easy choice, though. The Meat Lover’s Omelette, with its smoked ham, bacon, chorizo, green onions and mild white cheddar lit a sparkle in my eye, as well. And, of course, the Smoked Salmon Scramble was a solid option, too. At the end of the day, the American Frittatas won. The frittatas also came with a side of fruits and melted dark chocolate. 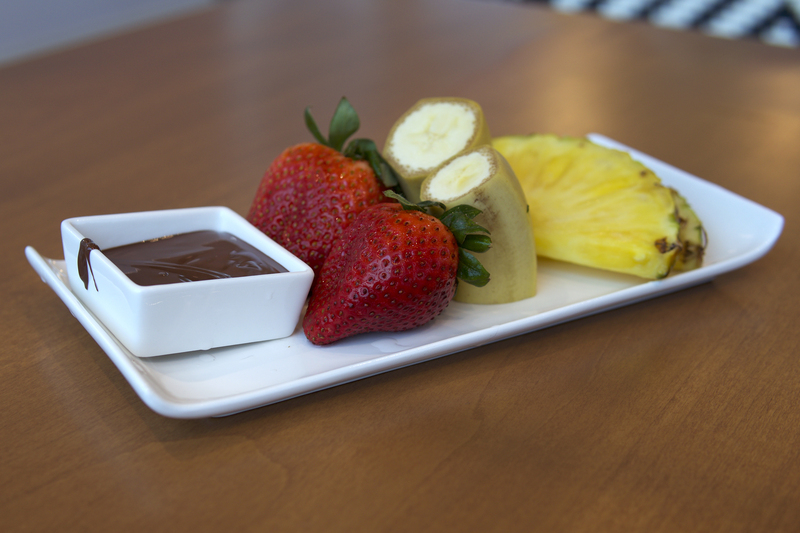 The fruits, which included two strawberries, two pieces of banana and two slices of pineapple, and chocolate arrived first. While the pineapple and strawberries looked good, the bananas had an unhealthy look to them. But when I tried a piece of banana (dipped in the chocolate, of course), it was perfectly alright. My favourite though were the strawberries which were very fresh, despite being out of season. The frittatas arrived shortly after on a skillet that had a cover on the handle to prevent the waitress who brought it over from burning herself. "It’s very hot so be careful," she warned. Two crisply toasted slices of bread laid on top of a bed of eggs, onions, and bacon. To the side of the skillet were packets of jam and butter. When I reached over to grab the jam for my toast, I accidentally touched the skillet. It was extremely hot, but I reacted fast enough to prevent a burn from sticking. The bread was light, toasted perfectly and went nicely with the jam. I dug into the frittata next. The frittata was delicious—the egg was cooked evenly and had a satisfying bounce when I bit into it. The smokiness of the bacon and acidity from the onion filled my mouth, only to be hit by the sweet tang of maple syrup. As a warning, this dish isn’t recommended for those who don’t like onion—it’s filled to the brim with it. You can't go to a place like Cacao and not overdo it on the desserts. I ordered two desserts: a half Hazelnut Chocolate Pizza and the After-Party Waffle. The After-Party waffle arrived first (even before the frittata, in fact), so you could call it an appetizer. They came with another round of fresh strawberries, plenty of whipped cream, a lovely berry sauce as well as chocolate bits. Because I didn’t want to ruin my stomach, I decided to leave the waffle until after I finished the frittata, so by the time I got to it, the waffles became slightly soggy from the melted whipped cream. Despite the soggy mouthfeel from the waffle, I enjoyed this dessert. It wasn’t as sweet as I anticipated and the chocolate flavour was prominent. 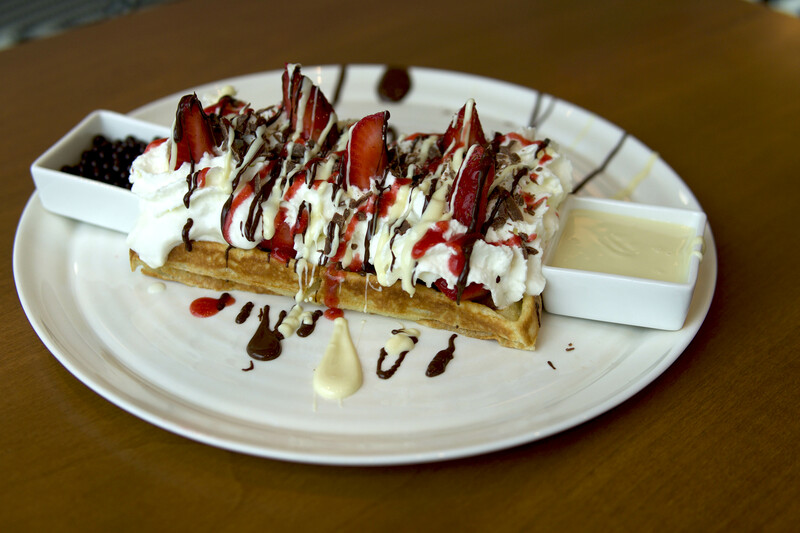 Due to the mountain of whipped cream and chocolate on top of the two waffles, I expected a battering ram of sugar to swing into the gates of my mouth; instead, I received layers of red fruit flavours from the strawberries and berry sauce. A friend recommended that I try the chocolate pizza, so I couldn’t resist ordering it once I had my hands on the menu. Similar to the frittatas, the pizza came with a side of fruits and melted chocolate—this time it was white chocolate and without the pineapples. A dark chocolate spread laid on a floury, beige pizza crust. 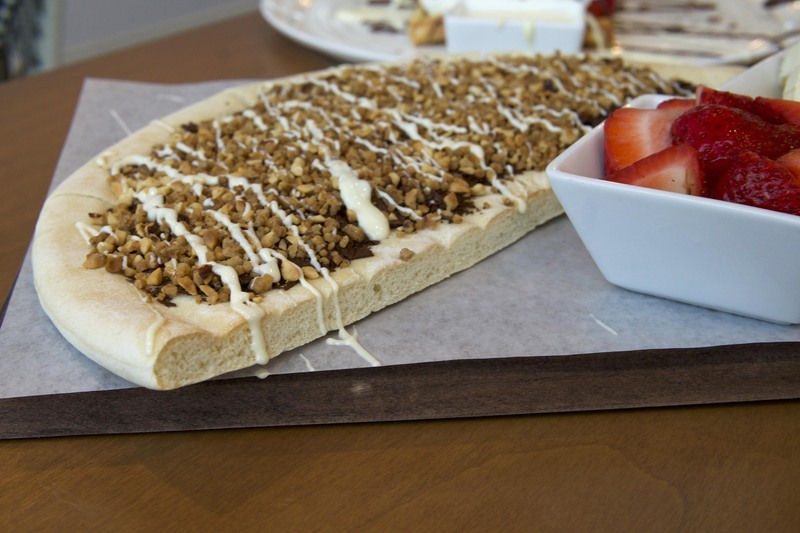 White chocolate drizzle and candied hazelnuts decorated the chocolate spread. Again, it wasn’t as sweet as I anticipated, despite several layers of chocolate. The quality of the chocolate really stood out as something more than the mass-produced bars that I and most Canadians are used to. The dish was quite heavy and, especially after two other dishes, I was getting very full. After two slices, I was defeated by the pizza and wished I had ordered the quarter size instead. 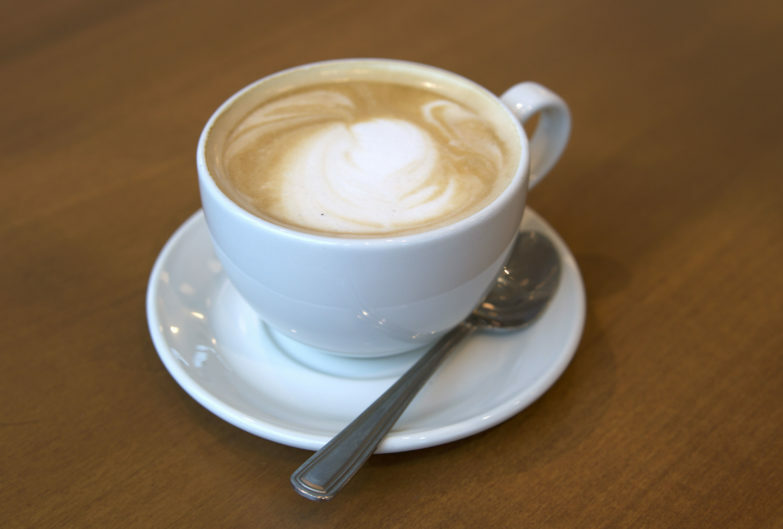 Cacao 70 has a variety of coffee and indulgent drinks on the menu. There were an American- and a Mexican-style hot chocolate, as well as chocolate shakes, coffees and teas, and smoothies (for brunch time only). I am a big coffee fan but also wanted to try the hot chocolate, so I went with the mocha. Additionally, there’s an option to add an ounce of liquor to any drink for around $5. It was still early in the day, however, so I took a pass. Unlike the desserts, there wasn’t a prominent chocolate flavour in the mocha. The coffee flavour was also weak, so I was left with a cup of steamed milk, more or less. I was a bit disappointed with the drink but that could have also been because I had high expectations. The place has two waitresses on staff. When I arrived, one waitress was very friendly and told me to pick any seat (again, due to the poor weather, the store was nearly empty). The lady in charge of my table checked on me several times and kept my water glass full. My seat was in a blind spot for the waitresses, which stood behind the counter filling out orders, so, at times, I had to walk up to them or provide a loud "excuse me" to get their attention. It would have been nice if the staff walked around a bit more. As time went on, more people filled the store and the service started to lag, as a result. The two waitresses tried their best to keep up, but they evidently weren’t expecting a sudden surge of customers on a day filled with freezing rain. They deserve and E for effort, though. I had had a lot of sugar between the waffle, the chocolate pizza, and the mocha—not to mention a pump of caffeine from the mocha. When I got home, I felt a bit jittery. Aside from that, I was very satisfied. I felt full but not overly so. 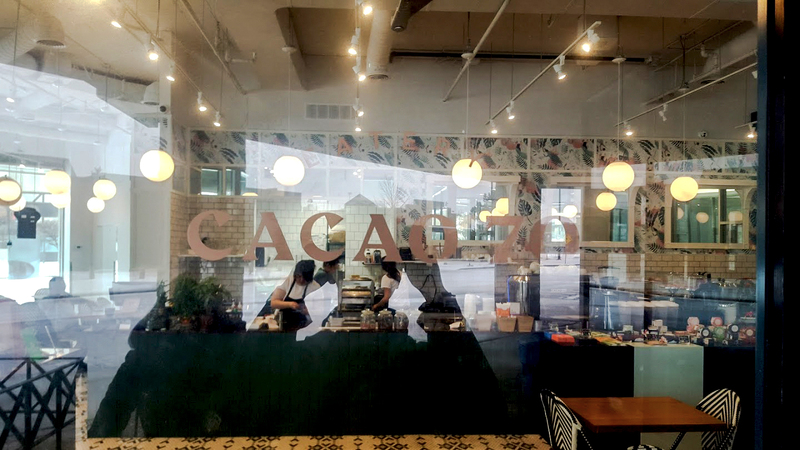 My experience at Cacao 70, overall, was good. I will most likely visit again in the near future to satisfy my sweet tooth. Next time, I want to try their crepes and full chocolate fondue set, which looked both aesthetically beautiful and delicious.